Today's date marks my official half birthday. It also marks the date the series finale of Gossip Girl will air on TV. Both aren't very happy occasions (what will I do without all that Gossip Girl fashion inspiration?! 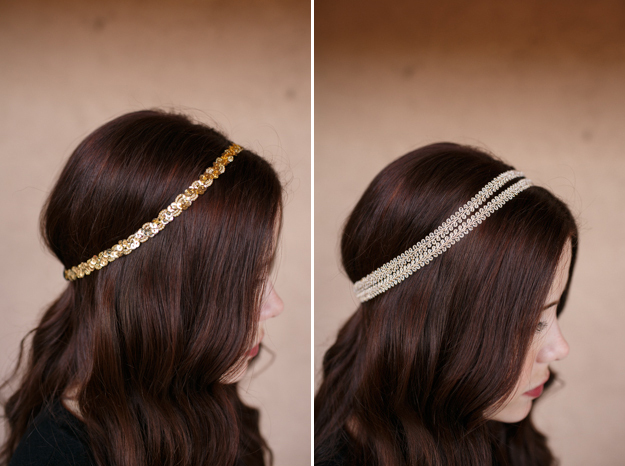 ), but in the spirit of making lemonade, I'm celebrating by showing you how to make some holiday-esque headbands. Headbands are one of mine and Blair Waldorf's favorite accessories and for me, I feel like they can take an otherwise ordinary ensemble to the next level. These are perfect to wear to holiday parties, or if you're feeling extra giving, as a gift to any fellow hipster friends. 1. Take your trim of choice and measure it around your head according to how you like it to fit and cut it 1-2 inches too short to allow room for your elastic. I don't like my headbands too tight or they give me a headache so I keep it just loose enough to fit comfortably on my head without falling off. 2. Measure and cut 1-2 inches of elastic. 3. Using your needle and thread, hand stitch each end of the trim to each end of the elastic, making sure not to twist it in the process. *To create double stranded headband on the right, just measure 2 pieces of trim instead of 1 and sew both of them to the elastic. I stitched both of them, pretty much one right on top of the other and at the same time so I didn't have to do double the sewing. Me and hand stitching only hang out when we have to. 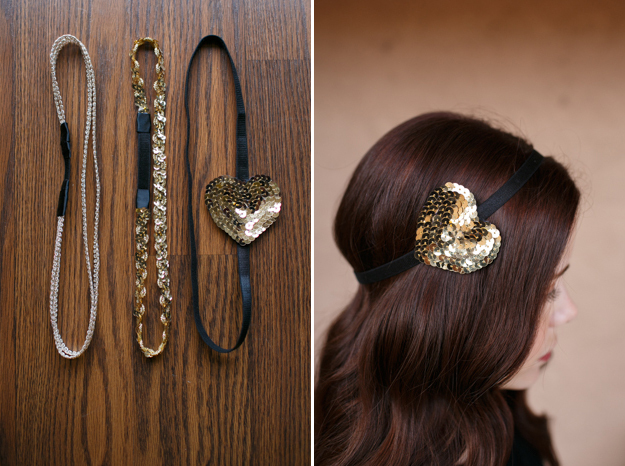 I found a tutorial for this type of sequin heart headband and although it's geared towards babies or little girls, I loved it so much I decided to make one for myself. I made the heart quite a bit smaller just to make it feel a bit more adult friendly. It might still look like a little girl's headband, but what can I say, I like to feel youthful. 1. Measure elastic around your head and cut it 1 inch short. 2. Trace 2 identical hearts (or whatever shape you'd like) on the felt and cut them out. 3. Glue the ends of the elastic to one heart, making sure not to twist it in the process. 4. Glue the 2nd heart on top of the 1st, making a sort of heart sandwich. This will cover where the elastic is secured to the 1st heart. 5. 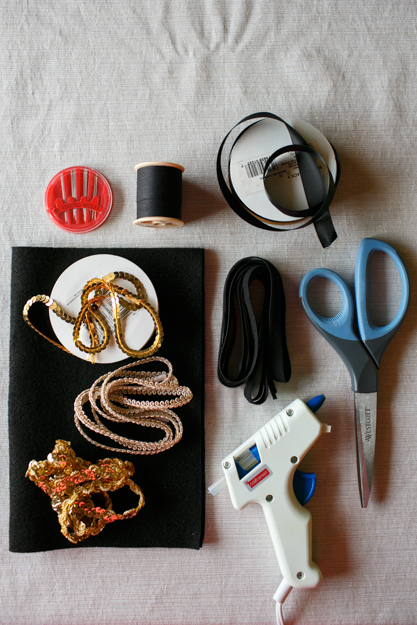 Working in small sections, begin applying a small amount of glue to the outer edges of the heart and secure the sequin string. Without cutting the sequin string, continuing working your way in and around the outline of the heart in sections making sure you cover all the felt until you reach the middle of the heart. *Be patient while completing step #5. The glue gets messy and you'll likely lightly burn yourself a few times when securing the sequin string to the glue. Or maybe that's just me. Whatever the case, I promise it will be worth it in the end! 6. Once you've reached the middle of the heart and secured the last sequin along the string, cut the remaining unsecured sequin string.